My children (3 and 2 years) love this book and it is often presented to me to read in the evenings. 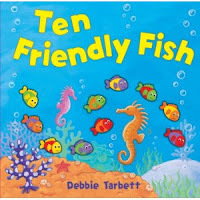 Because the fish are 3D, they can touch them and play with them while I read the story. It helps them learning to count as well as learning about different sea creatures. Insha-Allah, we are going to get a couple more of the Debbie Tarbett books for them. They had this book for about a year and still love it and keep coming back for more. All in all a very enjoyable and educational read for 2-3 year olds. The 10 fish are solid and raised and one disappears with each page turn. The only problem is the pop page at the end is not as sturdy as rest of the book and you have to be careful with it if you don’t want it to be torn after few uses. Our one is already damaged a bit. But overall it’s a good book to have.